2018: Reports on Satanic groups. "I hope other people and other groups see this. If anything, we just want to show that all religious groups and all people are equal. If another group sees this and they're like, 'if The Satanic Temple can do it we can do it,' I want them to. I want them to go out there and get their own stretch of highway and get their name on a sign. We definitely want to push equality. If anywhere, we could really use it here, so we're really proud to be able to do that for Indiana. 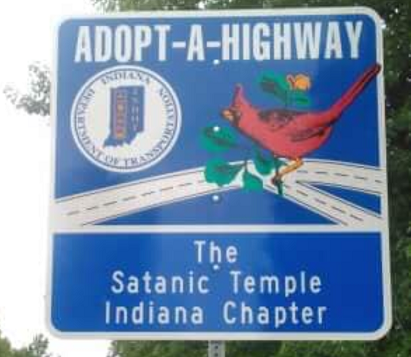 ..."
The Indy Star web site has a photograph of the back of a female member of the Satanic Temple Indiana who is volunteering to clean up the highway. She is wearing an orange garment with an inverted star -- a Satanic symbol -- on her back. It has one point of the five-pointed star aligned downwards. 3 Wiccans, a Neo-Pagan group who follow a reconstructed form of ancient Celtic Paganism -- also use a five-pointed star with one point aligned upwards. Many people confuse the two groups with each other. In reality, they have no beliefs or practices in common, except that some members of both faith groups use a 9 foot circle in which to perform rituals, and both groups follow their versions of the Golden Rule. The chapter makes other contributions to their community. At their "Second Annual Lunch With Lucifer" donations were collected and given to a local women's and children's shelter. They donated over 200 pounds of cat and kitten food to a local animal shelter. "We’re obviously believers in God. It’s like advertising a Satanic church in front of our home." Satanic Temple Indiana Chapter head Damien Blackmoor said the group is atheistic and they do not worship Satan. 'We’re not out here sacrificing babies,' Blackmoor said. 'That is a very difficult thing for a lot of people to grasp,' Greaves said, adding that people who think religion is dependent upon a belief in a supernatural entity often have trouble understanding the temple’s purpose." "To embrace the name Satan is to embrace rational inquiry [rather than] ... supernaturalism and archaic tradition-based superstitions." Many Christians, Muslims, and members of some other religions believe in the existence of an all-evil supernatural entity with magical powers who is dedicated to performing evil acts, and who roams the Earth destroying people's faith. Modern-day religious Satanists focus their beliefs on Satan as a principle, not a living entity. "... encourage benevolence and empathy among all people, reject tyrannical authority, advocate practical common sense and justice, and be directed by the human conscience to undertake noble pursuits guided by the individual will." The group also has seven fundamental tenets. Among them are the beliefs that the freedoms of others should be respected; beliefs should conform to a scientific understanding of the world; and that the struggle for justice is an ongoing and necessary pursuit. Provision of an ultrasound to view the developing embryo or fetus. It did not proceed because Mary Doe was not pregnant at the time of the judge's ruling. Their lawsuit probably would not have succeeded because Missouri law does not require a woman seeking abortion to actually read the pamphlet or view the ultrasound. An unidentified person tweeted a suggestion that people burn down The Satanic Temple headquarters which is in a residential building. When TST spokesperson Lucien Greaves tweeted a suggestion that his followers report the posting to Twitter as abusive, Twitter suspended Greaves' account. TST in Arizona joined the Adopt-A-Highway program. TST in Arizona also sought an injunction against prayer invocations in Scottsdale City Council unless they were open to all religions, including their own. TST members protested at the annual meeting in Chicago of International Society for the Study of Trauma and Dissociation (ISSTD). The ISSTD has a Ritual Abuse, Mind Control and Organised Abuse Special Interest Group (RAMCOA SIG) that promotes the belief in the existence of organized Satanic Ritual Abuse of children. After the state of Arkansas installed a Ten Commandments monument at the state capital TST attempted to have a statue of Baphomet installed as well. The Legislature blocked this statue. The TST announced that it was suing the state. The Bavarian government passed a law requring all public buildings to display a Christian cross. TST in the UK distributed crucifixes with hangers at the bottom so that they could only be hung upside down, and become a Satanic cross. Warner Bros. produced a TV series: Chilling Adventures of Sabrina. In it, a facsimile of TST's Baphomet statue was shown, and described as the idol of an evil, cannibalistic cult. TST threatened a lawsuit. Various TST groups erected Satanic holiday displays in Caliornia, Illinois, and Michigan, during December, to the horror of "Parisans of th War on Christmas." 2019-JAN to MAR: Chelsea Clinton says that Satanism "deserves our respect:"
"We can be civil, cheerful, respectful to & friends with people who don’t share our religious beliefs. Sometimes, we even marry them. I’m a Methodist & my husband is Jewish."